It's like how much more black could this be? And the answer is none. I'm practically foaming at the mouth wondering what the Sab Four will have in store for us fans. 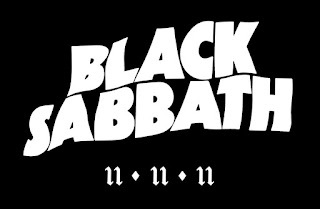 On National Metal Day (also known as National Nigel Tufnel Day and also Veterans Day) the Sab ones will make an announcement of some sort. My guess is a tour and a new album. If it's not than whatever this announcement will be will be bit of a disappointment to most folks. Especially with all the secrecy surrounding the announcement. While a reunion tour would be nice the real holy grail is a new album and the metal godfathers sure ain't gettin' any younger. If Dio-Sabbath could do it than certainly Ozzy-Sabbath could do it, right? Tony's got the riffs and Ozzy's still got some pipes. Just get it done. Hell, if Axl Rose could put out Chinese Democracy and if David Lee Roth can get back with Van Halen (and to possibly put out a new album) than it makes sense that a new Sabbath album with Ozzy could actually happen. Ozzy's last album sounds more like Sabbath than anything he's done in a while so he's got to be in the mood, right? Is that what they will announce on 11/11/11? I wish. 11/11/11 won't come around again until November 11, 2111 so this announcement better be something big. Or else it will look like a Stonehenge in danger of being crushed by a dwarf.